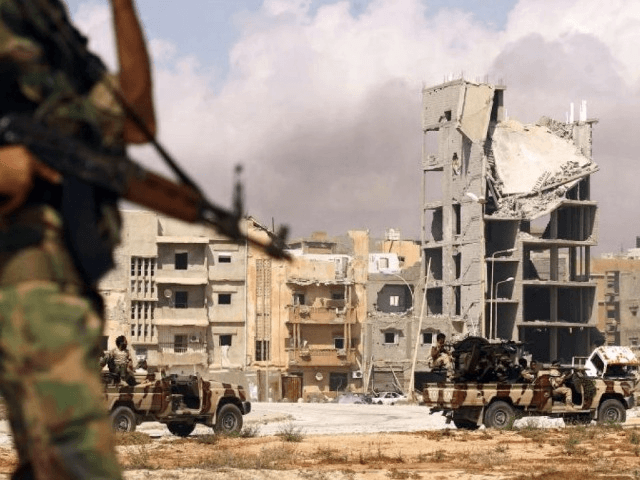 The Islamic State (ISIS/ISIL) is capitalizing on the chaotic situation in jihadi breeding ground Libya, establishing a new stronghold in the North African nation as U.S.-backed local troops in Iraq and Syria push the terrorist group out of their territory. ISIS jihadists are regrouping in Libya following their defeat in the country’s coastal city of Sirte, once considered the organization’s largest stronghold outside its so-called caliphate in Iraq and Syria, Libyan troops have said, echoing the U.S. military. “Terror experts claim the group is taking advantage of the chaotic security and political situation to use Libya as a launchpad for its resurgence,” reports the Daily Mail. “Having been chased out of the capital Sirte last year, ISIS is now believed to be recruiting jihadis from rural southern regions and the western town of of Sabratha, just 60 miles from the Tunisian border,” it adds. In December 2016, U.S.-backed Libyan militias cleared ISIS out of Sirte, located a few hundred miles from the European coast. “ISIS in Libya can regenerate quickly,” security analyst Robert Young Pelton tells Fox News. “ISIS has retreated south of Sirte to regroup,” adds Joseph Fallon of the U.K. Defence Forum, noting that the terrorist group remains a threat. “Here, it can jeopardize western interests through guerrilla warfare sabotaging Libya’s oil facilities and ports and through calculated use of terror to unleash a mass migration of people to destabilize neighboring countries and Europe,” he adds. U.S.-backed local forces are close to defeating ISIS in Iraq and Syria. Iraqi fighters already liberated Mosul, and their Syrian counterparts are combating the group in Raqqa, ISIS’s de-facto capital. “Terror experts claim the group is taking advantage of the chaotic security and political situation to use Libya as a launchpad for its resurgence,” points out Daily Mail. “More fighters are expected … to flow into Libya as the pressure on Iraq, and Syria mounts, exactly how big the ISIS ranks in Libya are at present” it continues. ISIS jihadists are believed to be regrouping in southern Libya, which the U.S. military targeted with airstrikes at the beginning of the year, less than a month after the terrorists’ defeat in Sirte. “We have spotted movements by Daesh [ISIS] in the south of Sirte, where they are trying to regroup and break through our forces’ lines in the south,” declared Mohamed Ghasri, spokesperson and senior commander of a Misrata-based al-Bunyan al-Marsous militia linked to the United Nations-backed government, according to the Independent. “The status of ISIS in Libya is they right now are regrouping. They’re in small numbers … after they left Sirte, we developed intelligence [and] we bombed them on January 18, and they were in the southern part of Libya. They’ve scattered again now,” said Marine Gen. Thomas Waldhauser, the chief of U.S. Africa Command (AFRICOM), in March.